A warm weekend of sunny skies in Sonoma and Napa. 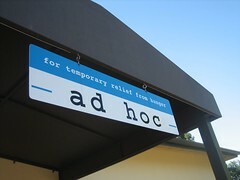 Made it to Ad Hoc for a fun and relaxing dinner. We started with a Summer Vegetable Salad harvested that day with a mix of perfectly cooked summer vegetables and fresh bibb lettuce simply dressed. The cauliflower, zucchini and squash were cooked lightly retaining their crunch but showing off their flavor, the salty punctuation of the nicoise olives played off perfectly against the vegetables and the slight tartness off the peeled cherry tomatoes. This was my favorite dish of the evening. We liked this so much we asked for seconds. Next came the Herb Crusted Colorado Lamb Sirloin cooked to a medium rare, juicy with a light hint of herb from the crust. Particularly interesting were the scarlet runner beans which were deep purple colored gigante type beans that had soaked up the flavor of the lamb. The beans made the lamb infinitely heartier. I also had an opportunity to sample the alternate dish of perfectly cooked salmon. Served on the side were some bright green, if a bit soft, english peas with fried pork confit topped with a few shavings of ricotta salata. The fried pork confit were little chunks of pork belly lightly breaded and fried so that it had a crispy exterior contrasting against a soft interior of various layers of fat and tender meat holding it together - a nice play of textures. Next came the cheese course, which I didn't get the name of. It was a mild cheese served with a sweet onion marmalade and marcona almonds - not notable. We ended with a nectarine ice cream with salted caramel sauce and bits of netarine garnishing the top. There was little nectarine flavor and the caramel sauce could've been more salty. I did, however, appreciate the presentation in an old fashioned ice cream dish and enjoyed the candied pecans at the bottom of the dish. The first two courses were good enough to bring me back to the restaurant. The only weakness was the dessert course. The atmosphere is relaxed and the friendly staff was knowledgeable. They clearly aim to accomodate their guests with information about the menu, wine recommendations and second helpings.